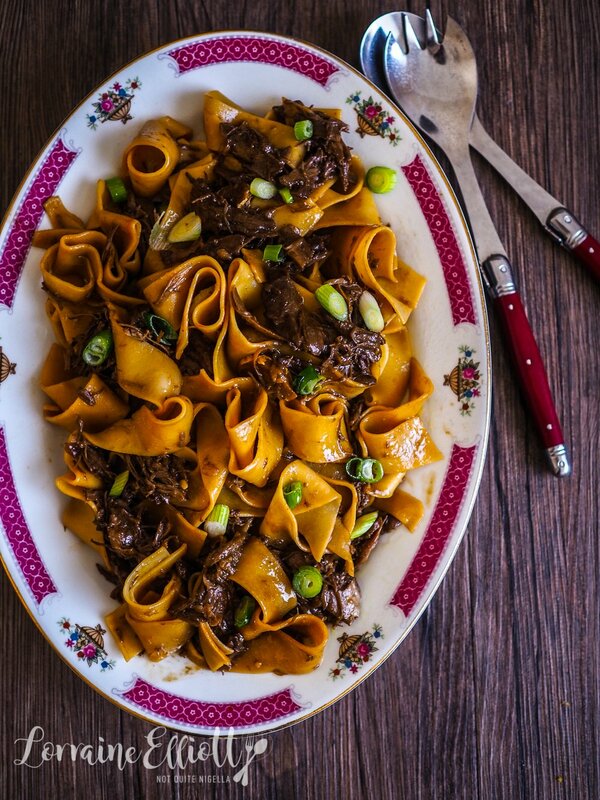 Italian duck ragu pappardelle is of course a popular classic but have you ever tried an Asian version of it? 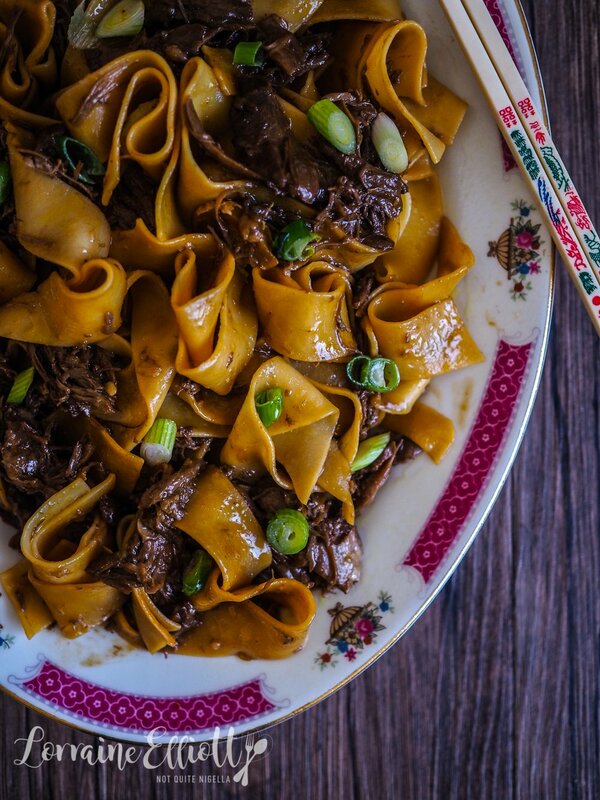 This dish is a riff off Peking duck and produces a wonderful, sweet, sticky ragu that pairs perfectly with the wide ribbons of a pappardelle! And Dear Reader, this is a pushy recipe! I have a slight obsession with minimising waste. A Dear Reader commented on it when she watched my Instagram stories and noticed how many bits and pieces I use up. I think that was her polite way of saying that my lunches for Mr NQN are very random. And for his part, he doesn't seem to complain as his only alternative is to make it himself or buy it. The duck that I used for this was a Peking duck that we bought. 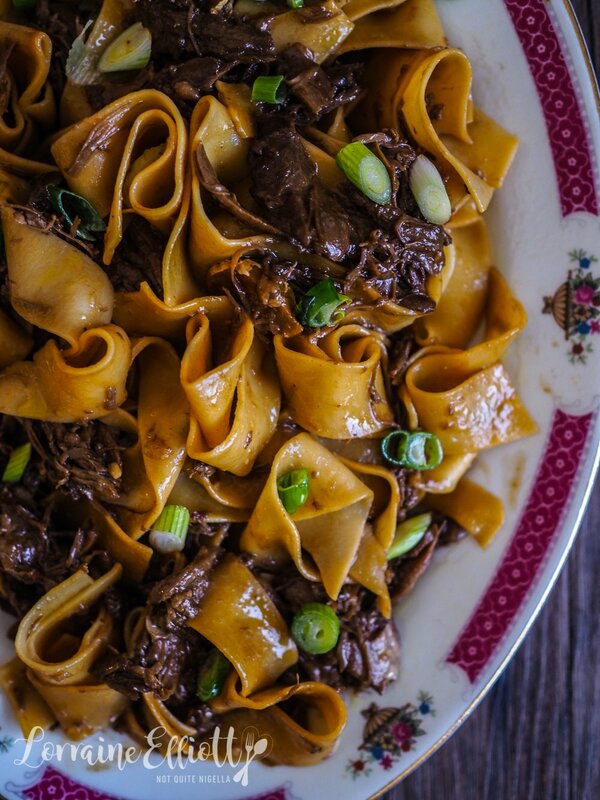 We got one meal of the duck skin in pancakes, Mochi got her share and then I stripped the duck of the meat for this pappardelle and then cooked the carcass to make a cream of chicken or duck soup. From one duck which was $26 I got enough for easily a week's worth of dinner. I don't know why I find it so satisfying and please don't think I'm being smug. I just don't like wasting perfectly good food. 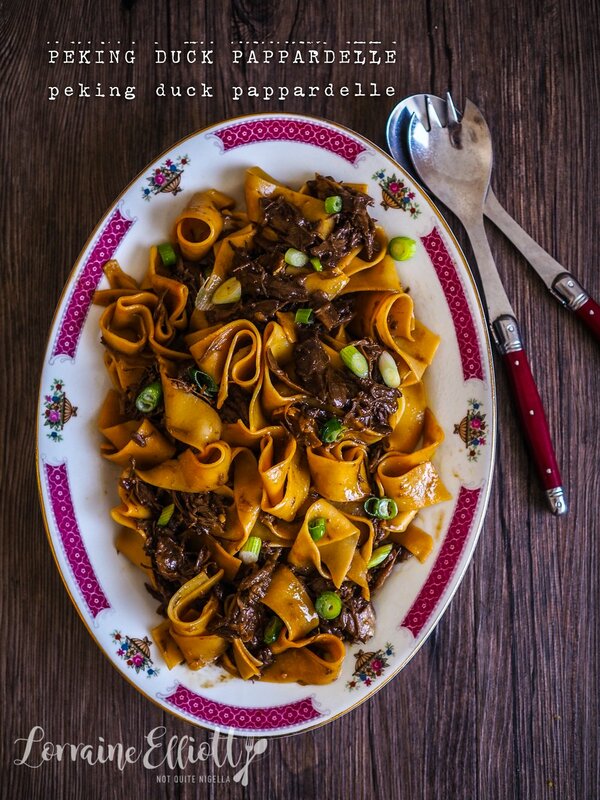 And pappardelle and ragu is just about the best comfort food combination and use of pasta carbs I can think of. I'm a bit of a fiend for carbs like pasta and pizza. I recently showed my true colours to my friend Girl Next Door. We were driving to a pizza place and I had spent the whole week/day thinking about eating this pizza. I was stuck behind a driver that was driving at half the speed limit for a good kilometre for no reason (they weren't looking for a park) and I was getting impatient. "Come onnnnn!" I said exasperated. I couldn't go an alternate route because I didn't know the area very well and so we plodded along behind this slow-as-molasses driver. I think they were cruising purely on momentum. So tell me Dear Reader, do you love carbs? What is your favourite carb or pasta combination? And are you obsessive about waste minimisation? Step 1 - Fry the onion in oil until translucent and then add the garlic and ginger and fry for around 30 seconds or so. Add the duck meat, stock, hoi sin sauce and two soy sauces. 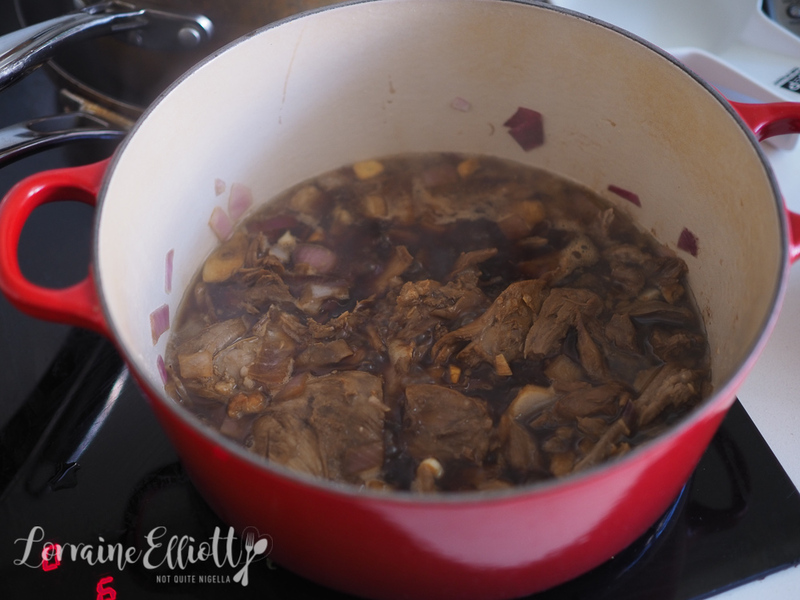 Step 2 - Place the lid on the pot and bring to a boil and then simmer with the lid on for 1 hour or until the meat is soft and falls apart. If you still have a lot of sauce you can reduce it down by simmering without the lid (but I find that the pappardelle soaks up a lot of sauce). Step 3 - Boil the pappardelle in plenty of salted boiling water. Toss in the pasta sauce and serve with extra spring onions. recipeLean & Green: Asparagus, Broccoli & Spinach Linguine!